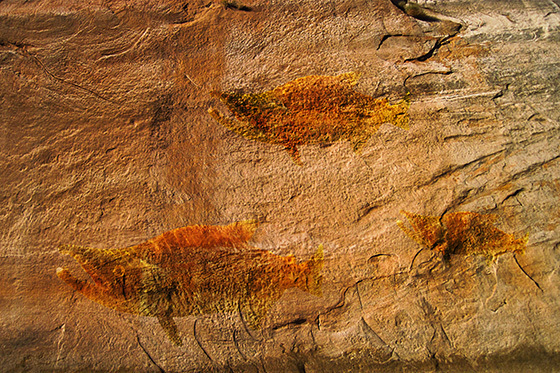 Salmon Stone by Stephen Pidcock. A compilation of photographic images of salmon and sandstone cliffs. "I grew up in the high deserts of north west Colorado and eastern Utah. Stone cliffs filled with Native American art were easy to find. The sense of ancient paths always captured me as I would find evidence of previous cultures and marvel at the skill of survival. If only stone could speak and tell of the history of the cycle of life. From canyon rivers and salmon runs, to the decline of buffalo, and migrating elk herds, the wild horses and cattle etched in the wilderness. How amazingly resilient and yet how fragile nature can be. Using a camera to capture natural textures and animals I considered the cycles of life long before humans arrived in an area. In this series of compilation photographs my desire is to allow the imagination to recognize the past and the future."